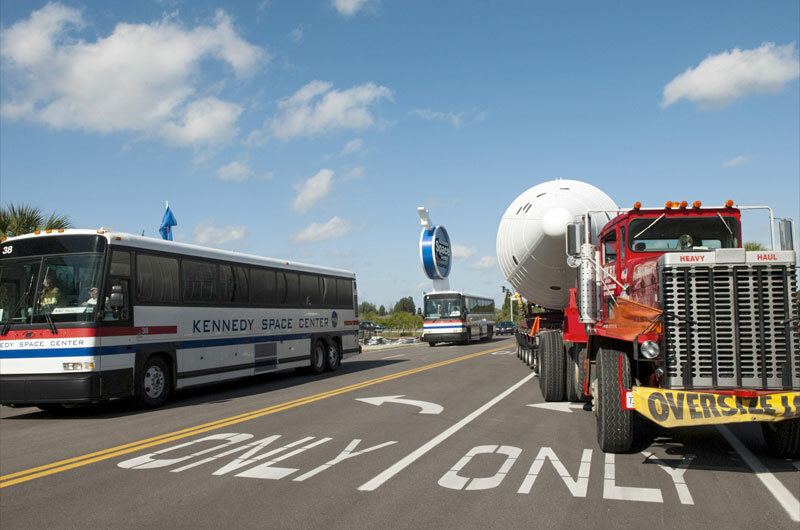 — Construction workers at NASA's Kennedy Space Center Visitor Complex in Florida began clearing a path Tuesday (Nov. 29) for the arrival of space shuttle Atlantis, which is slated to go on display there in 2013. Employing a pair of large cranes, workers from Beyel Brothers Crane and Rigging lowered the first of two 100,000 pound (45,359 kg.) 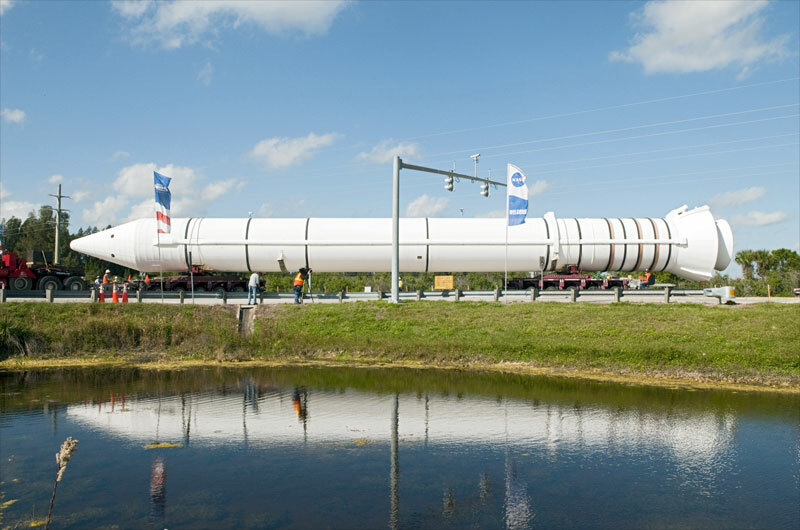 solid rocket boosters (SRBs) off of its exhibit stand and onto a transporter. 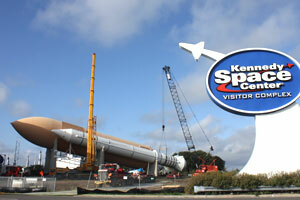 Over the next couple of days, the construction crews will remove the second booster and an 87,000 pound (39,462 kg.) 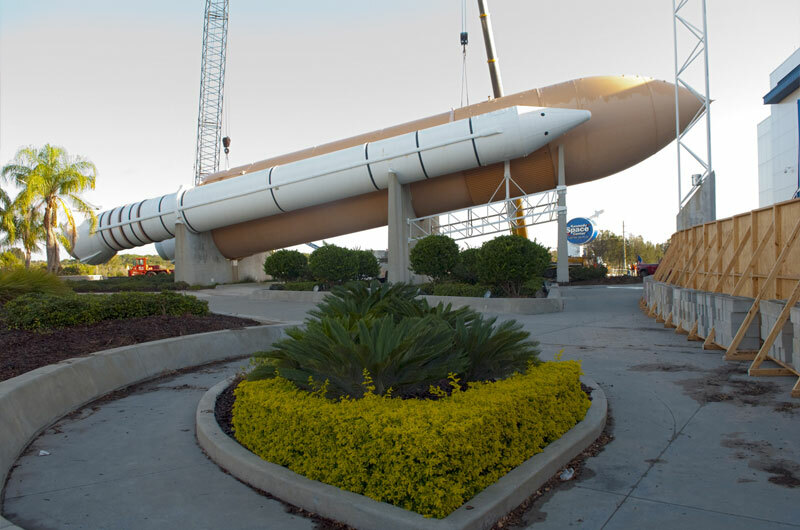 external tank that for more than a decade has been on prominent display at the Visitor Complex. 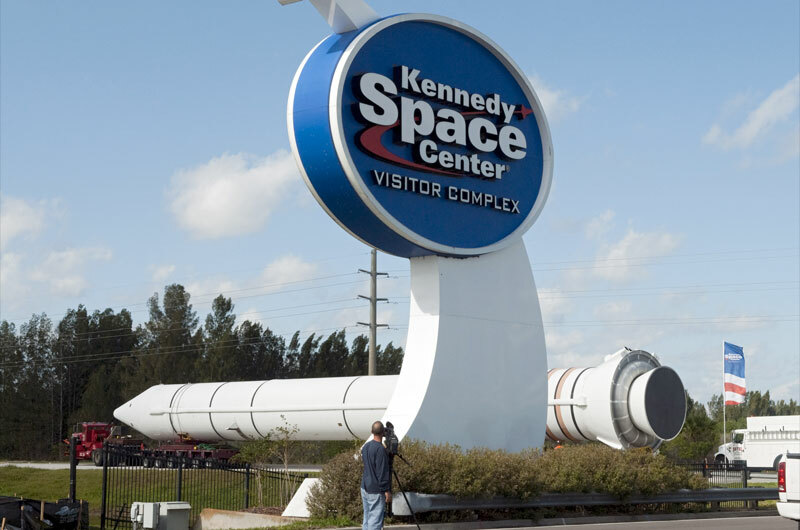 "The SRBs were put on display in Shuttle Plaza in 1994, and that was followed by the external tank in 1997," Visitor Complex spokesperson Andrea Farmer said in an interview with collectSPACE. 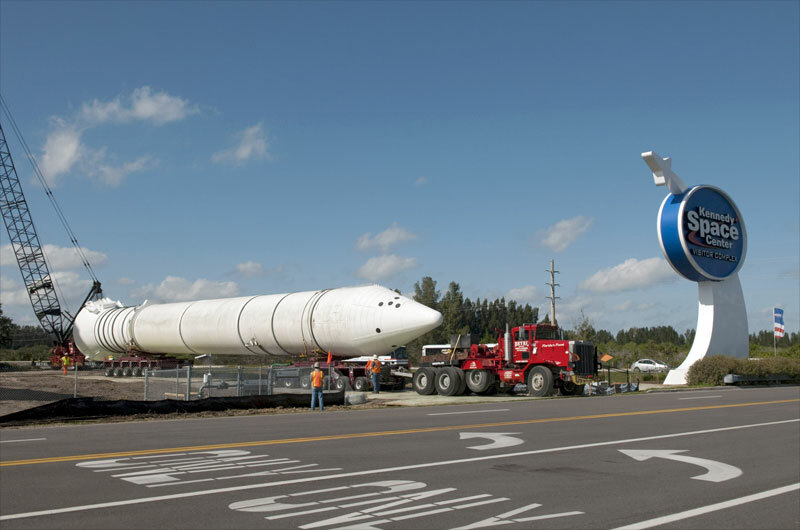 The boosters and tank, which are representative of the propulsion components that launched the space shuttle orbiters throughout the 30-year program between 1981 and 2011, are a mixture of real and replica hardware. 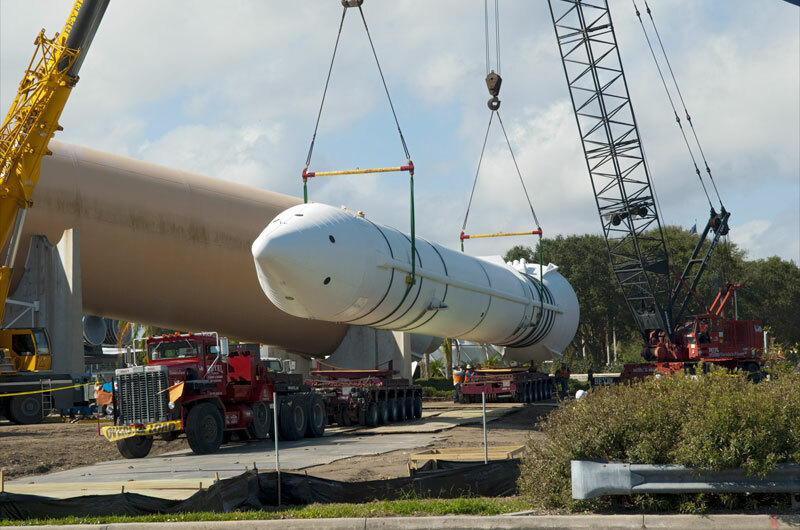 "The external tank was a 'fit-check' tank, a full-size mockup, that came from the Stennis Space Center [in Mississippi]," Farmer said. "For the SRBs, the aft skirts and nose cones are fiberglass, and then for the four segments [in between], two are steel and two of them are filament." 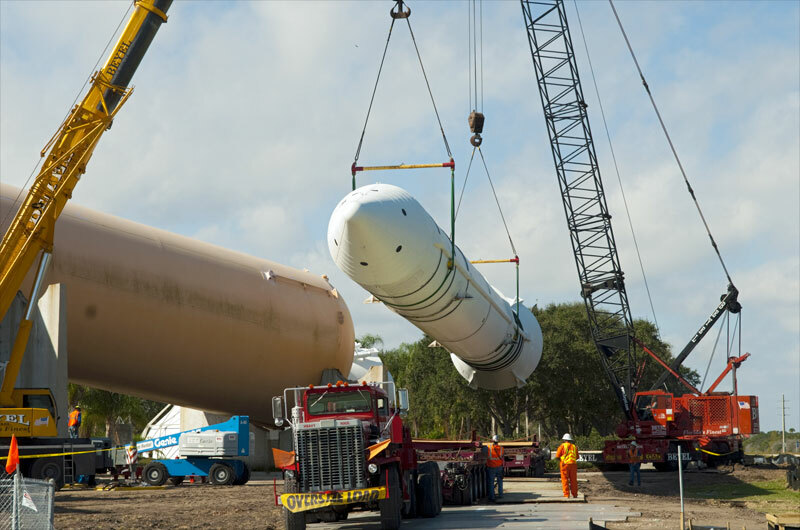 The twin 149-foot (45 m.) long boosters and 154 foot (47 m.) long tank are being trucked to a nearby staging lot until their future can be determined. "They are right now going to the [Kennedy Space Center's] transfer and disposal area," Farmer said. "I believe they may ultimately be given to another location." 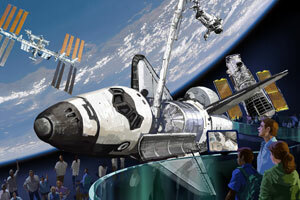 Among the potential recipients was Space Center Houston, the visitor center for NASA's Johnson Space Center in Texas. 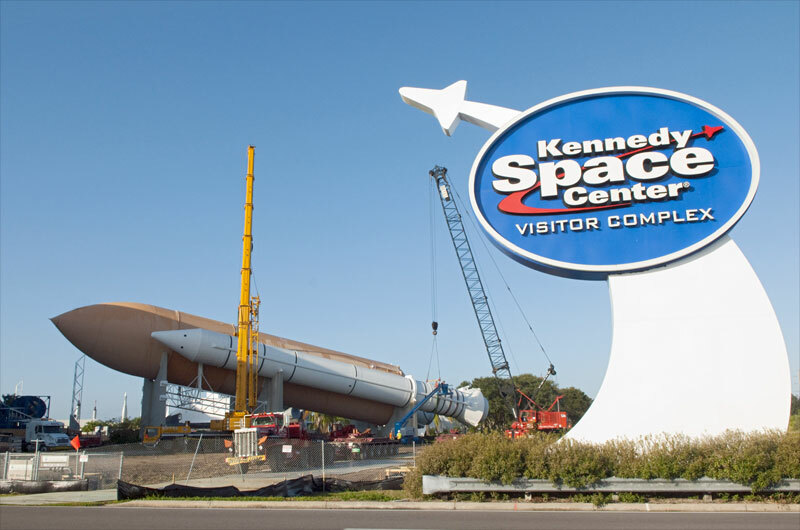 They were unable to take the boosters and tank but will be receiving the next large item to move from Shuttle Plaza: a full-scale shuttle orbiter mockup. The Explorer replica with its gantry walkway that allows visitors to tour inside the orbiter will be similarly dismantled and hoisted out of the way, so construction can begin on a new building to house the real shuttle Atlantis. A date has not been set yet for Explorer to ship to Houston. Ground breaking for the planned 65,000 square-foot, $100 million exhibition facility to display Atlantis is scheduled for early next year. Atlantis, which flew NASA's 135th and final space shuttle mission in July, will be rolled down the road from the Kennedy Space Center's Vehicle Assembly Building in November 2012, and, as is currently proposed, will be ready for public display by July 2013. 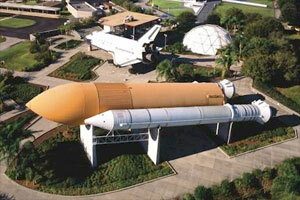 Atlantis is one of four shuttle orbiters NASA is retiring to museums. Fleet leader Discovery will be delivered to the Smithsonian's National Air and Space Museum in April 2012 for display at the Steven F. Udvar-Hazy Center in Chantilly, Virginia. The prototype Enterprise, which since 2003 has been exhibit at the Udvar-Hazy, will head north to New York City for the aircraft carrier flight deck of the Intrepid Sea, Air and Space Museum. The Intrepid took title to the Enterprise on Nov. 22. Endeavour, the youngest of the orbiters, was made the property of the California Science Center on Oct. 14, when the Los Angeles museum held a high-profile title transfer ceremony. Endeavour is scheduled to touchdown on the Pacific coast in the fall of 2012. NASA engineers have been working since the shuttle program came to its end to prepare the orbiters for public display. In addition to saving hardware from each for possible future reuse, workers have also been making sure that the orbiters are safe for the public by removing fuel and other hazardous systems. © 2019 collectSPACE.com All rights reserved.